We’re constantly scouring the Internet looking for articles related to family finances and teaching kids good personal finance habits. You can visit the FamZoo delicious page to see our ever growing list of family finance bookmarks. We’re up to 1,443 now! Each week, we pick our favorite articles from the previous week and post them here. In honor of Mother’s Day this Sunday (you do have your plan together for that don't you? 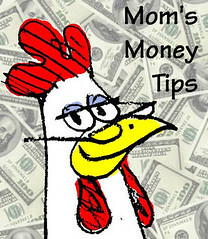 ), Tracy offers the top 4 family finance lessons she learned from her Mom. I like’em. How about you? Got any gems to share from your Mom? OK, I’ll go first with two things that stick out for me from my Mom. First: be organized. My Mom was always (and still is) super organized. Lots of lists and notes to keep all the details together. I definitely inherited that gene, and it’s helped me tremendously in financial matters (among other areas). Second: appreciate what you have. Mom used to always tell us: “you boys don’t know how lucky you have it!” to which my brother and I would respond with the obligatory teen eyeball roll as a show of thoughtful acknowledgement and understanding. But, take heart parents! The repeated messaging ultimately seeps through. In my case, Mom’s messages instilled a strong sense of moderation — something I consider a key component of financial well-being. Many lament that we aren’t raising our kids to be entrepreneurs. (E.g., see Cameron Hold’s Ted video here.) What’s one of the simplest, most familiar ways for a kid to learn about the full life cycle of starting and running a business? The lemonade stand. Did you know that last Sunday was National Lemonade Day? Did you know that last year, little Lemonade Day entrepreneurs sold $6.8 million dollars worth of lemonade? I certainly didn’t until I read Tamara’s interview of Michael Holthouse. Michael’s an entrepreneur and philanthropist who founded the non-profit Prepared 4 Life. Their mission: help kids become contributing members of society through practical, hands-on activities — like planning and running a lemonade stand. To learn more about the program, read the inspiring interview here. As a final homage to the passing of Financial Literacy Month, here’s a great article to bookmark for future reference. JD’s “Financial Literacy Toolkit” provides a convenient, well organized roundup of links to their best material on financial fundamentals. Don’t miss the video links at the end. Keep it handy as you step through financial concepts with your kids over the years. Need to explain credit cards? Compound interest? Budgeting? Mutual funds? It’s all here. Teaching your kids to use money responsibly is one of the best things you can do for them.